Pelseal Technologies, LLC offers high-solids fluoroelastomer sealants and caulks, specially formulated to reduce shrinkage and improve the ease and speed of application. 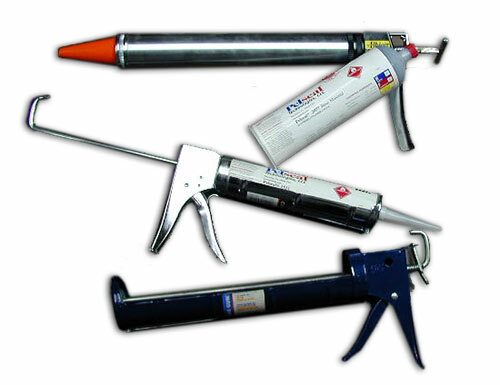 We offer a broad selection of these high-performance sealants and caulks that include, but are not limited to, those listed below. Less Shrinkage: With solids content of 75% or better, these patented products have less shrinkage and more yield than other fluoroelastomer caulks and sealants. Less shrinkage means fewer applications - which translates into major savings. Environmentally Friendly: By using less solvent, VOCs are dramatically reduced (an 80% solid fluoroelastomer sealant will contain half the solvent as a 60% solid traditional variation). Pelseal® 2690: 1-part, black sealant. High solids content (77%). Non-sag for horizontal and vertical applications. Pelseal® 3159: 2-part, gray sealant. Low viscosity with high solids content (83%). Self leveling for horizontal applications. Pelseal® 3169: 2-part, gray sealant. High solids content (85%). Trowel grade for vertical applications. Pelseal® 6080: 2-part, charcoal-gray sealant. High solids content (80%). Trowel grade for horizontal and some vertical applications. Pelseal® 6200: 2-part, gray sealant. Low viscosity and flexible with high solids content (75%). Self leveling for horizontal applications. Viton™ or Dyneon™ based fluoroelastomer sealants and caulks provide excellent resistance against sulfuric acid, hydrochloric acid, nitric acid, gasoline, diesel fuel, jet fuel, crude oil, and can withstand temperature extremes of -40 to +400 degrees Fahrenheit (-40 to +205 degrees Celsius).